We got to the hospital Friday at 8am for check-in. I'll preface everything and just say that this hospital is beyond amazing. Being a children's hospital, their entire focus is on making the kids comfortable and the family involved, which in our case is a big task! I can't say enough about all the doctors, nurses, amenities and volunteers in the hospital. The nurse triaged BabyGirl and alerted us that the procedure was again delayed to 11a. This created 2 additional hours BabyGirl couldn't eat and the poor thing was STARVING. We played in the play area for a while, spending time with family as BabyGirl played. A child life specialist came by with a mask for her to see and some pictures of the procedure room, to kinda prepare her for the coming events. The nurse walked us back to the cath lab and opened the doors. There was no way BabyGirl was walking into the huge, scary room. Though it was muralled from floor to ceiling with colorful images, the massive machines in the middle of the room were the focus. The nurse allowed me to walk in with her and get her situated so she would be a bit more at easy. We sat her on the padded bad and the anesthesiologist showed her the mask. She panicked. So he took the mask off and just waved the tube in front of her to calm her. Over the longest 90 seconds of my life, I rubbed her leg and talked her into a sleep, reassuring her I was still there. She got a bit combative and reached out for me with fear in her eyes, which is probably an image I will never erase from my mind. We waited. It took just short of 2 hours. I went to eat, which felt like the most ridiculous thing I could have possibly done, but I knew I wasn't leaving her side later. Every time the doors opened to that wing my heart stopped, hoping it was the doctor. When the doctor came out, he sat in the waiting room with everyone, allowing all the family to hear the results. He said he felt really good about doing the procedure and it answered the questions we were looking for, without having to do the transesophogeal echo. The left atrium of her heart was double the size it should be, and our question was why. Myocardial Bridge causing Restrictive Cardiomyopathy, resulting in the Left Atrium being backed up with blood and large. Both very rare. Myocardial Bridge- Literally a bridging of heart muscle over one of the major arteries to the heart (usually the left anterior descending artery). The heart has formed in this abnormal design from birth, whereby the artery is actually 'tunneled' through a part of the heart muscle. 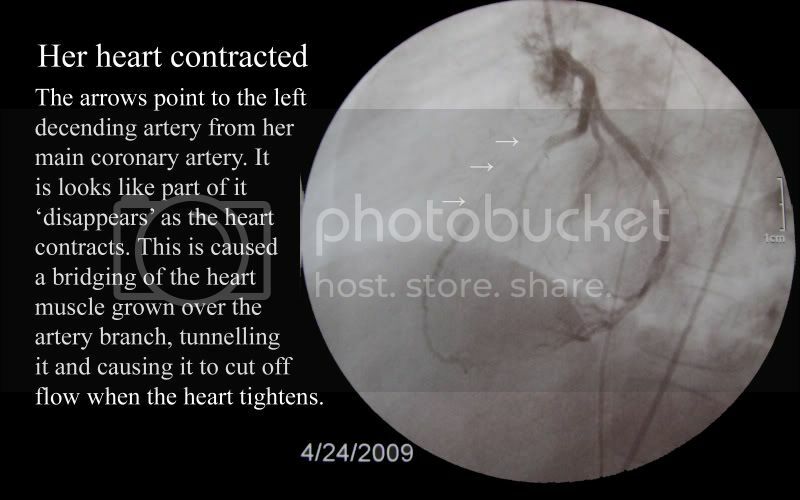 This causes blood flow to be limited to the Left Ventricle, resulting in the second condition. Restrictive Cardiomyopathy- A restrictive cardiomyopathy, the rarest form of cardiomyopathy, is a condition in which the walls of the lower chambers of the heart (the ventricles) are abnormally rigid and lack the flexibility to expand as the ventricles fill with blood. This restriction causes the left atrium to not fully dump its blood into the ventricle, therefore it is full and large. Turns out, she has probably never had asthma. I don't quite remember how, but one of these malfunctions or blood flow restrictions leads to the lungs. Her asthma like problems and coughing is all related to her heart not supplying her lungs with what they need. I asked the doctor what would have happened if we had not caught this. He used a bunch of smooth and loving words that all meant cardiac arrest. So I asked him how we fix this. He said we can put her on a med that will slow her heart down and cause it to not work so hard. I immediately knew in my gut this was the simple band aid for it, but not what would cure her or give her quality of life. When I told him that was just the band-aid, he said yes, it was. The best way to fix something like this is heart surgery. Go in and cut out that muscle area causing the blood flow problem, and HOPE that creates more blood flow to the ventricle, allowing that to be more flexible so the left atrium can empty fully. This is a condition that can come back though, as she gets older. So many unknowns. So many "if's" and "hopes". But really no other choice than heart surgery if I want her to be healed. I don't really need to go into all the feelings I felt as I heard this, nor do I want to keep scraping that open wound I have to explain it on here. Fear, panic, helpless, stress, sick, petrified.... those words explain a fairytale in comparison to the reality of it for me. After he told me the news, I really felt there was no other reason to sit there. He walked us back to be with her in the PACU. She was laying there watching a little TV, oblivious to the reality of it all. She spent a good 2-3 hours like that, laying there, not saying much. She spiked a fever but the amazing nurses quickly attacked it. She got sick, and after that it was like a new child was laying there. She started talking and smiling again. My baby was coming back. She had to lay there for 6 hours, straight and not moving her right leg. She did an AMAZING job, especially for a 4 year old. I know many adults who would have complained all the live long day about that! She ate a popsicle, macaroni, goldfish crackers, teddy grahams, drank Sprite and water. She was amazing. Of course, my mind was looking at her like this was only the beginning now. We took her home around 7pm, and she did amazing on the way home. She slept in our bed and had a restless night, but woke up pretty happy. Next steps are consulting with the cardiologist, then cardiac surgeon, then surgery. I can't help but think of all the things I want to take her to do before then. I have no clue what time frame we are even looking at or how quickly they want to do this. But the comforting this is we have this time to prepare and do this, as opposed to finding out the hard way and being even more blindsided by it all than we are. I thank God from the bottom of my soul for my pediatrician who took a simple and typically harmless murmur, seriously. We have the most amazing family and friends in our life, and we know that because of them and their love for my BabyGirl, we will walk through this together. We went on Tuesday and had the 2nd echo cardiogram done. The doctor was supposed to call me Wednesday with the results, and naturally he waited until after 4pm to call. It was treacherous waiting, let me tell you. When he did call, he said the results were comparable to last month. That was enough confirmation for me that we did every test we could non-invasive prior to doing this catheter Friday. He said there was still no explanation for the enlargement and that there was mild leakage from the valves. I am hoping to have a better understanding tomorrow as to what that means. I have been asked a few times what is wrong with her and what tomorrow will entail. Really, we don't know whats wrong with her, therefore we don't know what the future of treatment may hold. Tomorrow's hospital visit is diagnostic. She will have a Cardiac Cath and Transesophageal Echocardiogram. At 7am we will check in and 9am her procedure will start. It takes approximately 2 hours to do. She will be put completely under, and stay in the hospital for a majority of the day for recovery. We should hopefully have some preliminary results, hopefully giving us a general answer as to what is going on with my seemingly healthy and symptom-free girl. A full workup of results will come in a few days. We told her last night this was going to be happening. Of course, we turned it into a story a 4 year old could understand. We told her her heart was precious and the doctor wanted to make sure it was working perfect. We told her she would take a little nap while he looked at it, and ALL her family would be there with her. She was OK, then asked if she would have to get a shot. Since I won't lie to my daughter, I had to tell her she was. She started panicking and crying, so we agreed we would tell the Doctor that she didn't want a shot. I figure at this point, they can prepare her for the blood work and IV. Hopefully, they give her that pink medicine to calm her like they did for her root canal and crown and she won't even realize it all. I wholeheartedly trust the doctor performing the procedure. He is a very busy pediatric cardiac surgeon, yet never rushes me on the phone when I have the most ridiculous questions. I haven't met him in person yet, but already know he will take the best care possible of my baby while she is in his hands. For the record, it is not as much about the procedure tomorrow that has me so freaked out. Although the idea of the anesthesia, invasion into her heart, and the pain she will be in after are concepts I can hardly think of without waves of panic... it is more about the results for me. This is just the question. The answer comes later. What comes next? How do we fix whatever it is that is wrong? Will she be on medication? Will she need surgery? Will she be given a standing order for the rest of her life to take it easy, putting a road block around the ability to play sports or even run the playground with vigor as only a kid can do? Please pray for the results. 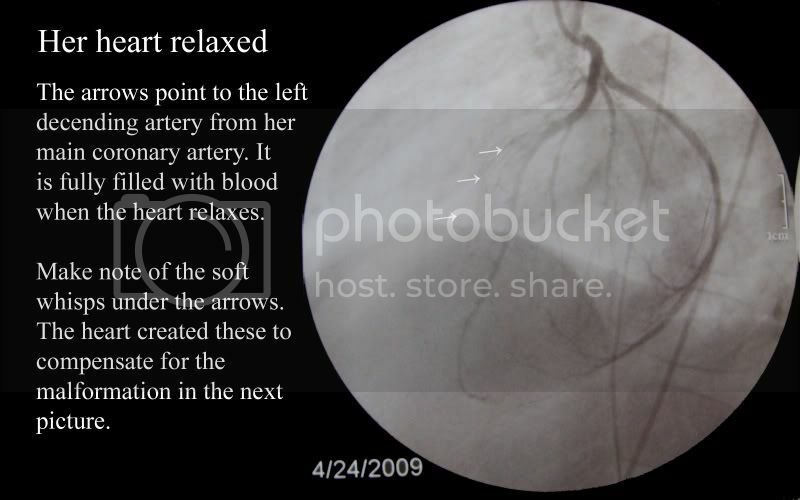 The key problems with her are unexplained enlargement of her left atrium and mild leakage of her valves. Time flies by me before I realize I haven't updated. Life has gotten to be so busy, I neglect my poor blog! My mommy instinct kicked in a couple weeks ago regarding this cardiac catheter. It is just me to question everything. I always have, and always will. I decided to call the cardiologist and talk to them about the absolute necessity of this. This procedure is the 'best way' to get a look at the cause of BabyGirl's big heart, which I completely understand. My problem lays in the fact that they are doing this procedure (safe and routine, yet invasive) based on the results of one scan. I questioned the doctor as to possible causes for this. Fluke? Virus? Activity? Etc? In my eyes- as much as something could be wrong, it is equally as possible for nothing to be wrong. I asked him if it were unreasonable to request another echo before we went on with Friday's procedure and he supported me 100%. We go today for a second echo. Although the half hour of her having to lay completely still is hard, it is not even close to being as hard as prepping BabyGirl for this procedure and the 3-4 days post procedure will be. If the results show no change from last month, I will go to the hospital with confidence we are doing the right thing but reassured that we responsibly checked. But if there is any improvement, or God bless it- it is resolved, I will know that I did the right thing by having it looked at again. My God protects, heals and loves. I know if He hasn't healed her for whatever reason, He will protect her, because He loves her and she was His to start. Gift bags made from envelopes! A guy who has way too much time on his hands! Toothpick art. The corrupted and morbid side of me loved these twisted princesses. Download classic novels for FREE!